The tide pools of Odiorne are home to an array of fascinating plants and animals. Located just outside our doors, tide pools are scattered throughout the rocky shore when the tide is out. If you plan to go tide pooling, be sure to check the tide prediction for the day of your visit; tide pools are accessible 2-3 hours before and after low tide. Don’t forget, you can see many of the same creatures that live in the intertidal inside the Center at our Indoor Tide Pool Touch Tank. 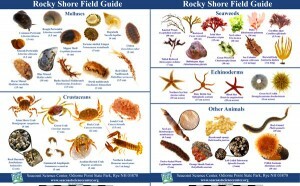 To assist in your exploration, you can purchase a Rocky Shore Field Guide at our online Nature Store or when you visit. Here are some safety tips to remember while exploring the rocky shore. Please observe all organisms where they are found, handle them with the utmost care, and quickly return them to the same location. Collecting is not allowed in Odiorne Point State Park. This includes dead or live species, shells and sand, and sticks and stones. 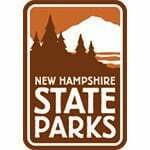 Thank you, in advance, for helping to keep our shore a special place for all to enjoy by protecting our natural resources. The intertidal is the area of the shore that lies between the highest high tide line and lowest low tide line. The intertidal is very dynamic, due to the varying strength of the ecological factors that affect it. These factors can be broken down into two groups: abiotic (or non-living) and biotic (or living). 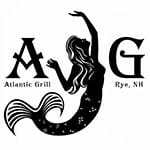 The most important abiotic factors for the North Atlantic shore are atmospheric exposure, wave exposure, temperature, salinity, substrate, and slope of shore. Biotic factors are competition, predation, and herbivory or grazing. The relationship of the tide with these factors results in visually recognizable areas called intertidal zones. Each intertidal zone has a narrowly defined set of conditions, which offer certain environmental conditions necessary for the survival and reproduction of the animals within that zone, as well as distinct challenges. The following is a general guide to the Intertidal at Odiorne, where we use a simple three-zone descriptive system. The Upper Zone is primarily moistened by splashing waves. Abiotic factors are the most influential, as temperature and salinity varies a great deal throughout each day. The Middle Zone is the largest zone at Odiorne due to the gently sloping shore. This zone is underwater about 50% of the time, making biotic factors play a major role in species survival. 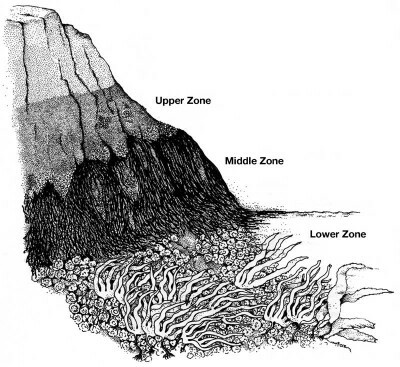 The Lower Zone is exposed only during very low tides and abiotic conditions are relatively constant compared to the zones above it. Species diversity is higher here and the biotic factors are more important in determining which species can survive. The area below the Intertidal is known as the Subtidal. This area is always underwater and therefore is abiotically stable. The Subtidal extends as far as sunlight (necessary for photosynthesis) can penetrate, which varies depending on the clarity of the water. Are you headed to the rocky shore with your classroom, or friends and family? 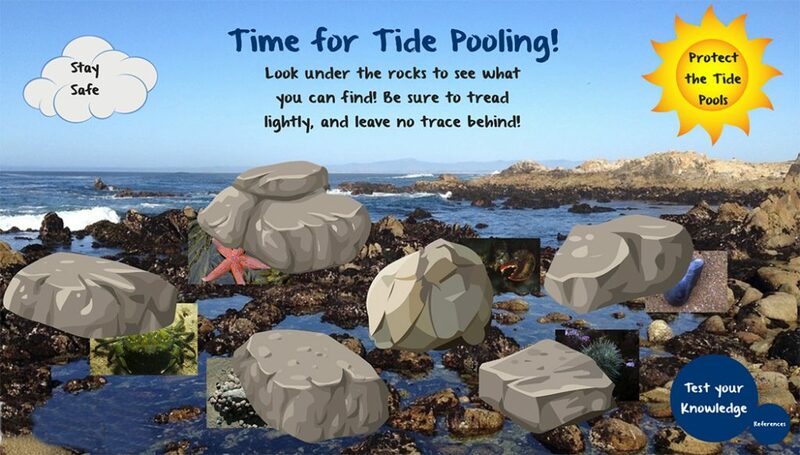 The Virtual Tide Pool is an interactive online resource that lets kids and adults alike explore the shore ahead of time. This Prezi-style presentation allows you to peek under rocks in order to learn more about your favorite tide pool creatures, such as where to find them, their unique adaptations, and how to observe them safely. This free resource shares information in a fun way, while encouraging you to think and wonder about what you might find in the tide pools yourself. The presentation can be viewed from beginning to end by clicking the arrows at the bottom of the screen, or you can bounce around to learn about your favorite creatures by clicking on the rocks and blurbs. After exploring, compete against family members, classmates, or yourself to test your knowledge of the tide pools!